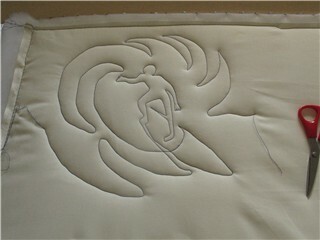 A friend of mine has asked me to quilt a surfer on her quilt. This one is from Laura Lee Fritz’s 250 More continuous-line Quilting Designs. Ho-o-o. It’s going to take a bit more practice! Is that a surfer or an alien?!! Hey, I recognized that it was a surfer immediately. What a fun quilting design. He is a surfer! You did a great job.